Moroccan lighting isn't just about seeing your way around the house. It's creating a positive atmosphere and a mood. Browse below to find a large collection of Moroccan lighting, practically everything to do with Moroccan lights and Moroccan light fixtures, including beautiful and ornate Moroccan lamps and Moroccan lanterns, elegant Moroccan henna lamps, Moroccan and Syrian hanging lamps, majestic Moroccan chandeliers, Moroccan star lamps and even wall hanging hooks. We also feature an extensive selection of Moroccan furniture and accents to create Moroccan style home decor and design. 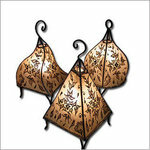 Be sure to browse the rest of our store to complete the exotic Moroccan feel of your home. We're sure you find something in our massive and beautiful collection to suit your fancy. Our Moroccan themed items also make wonderful and unique gifts. Do something different and Surprise your friends and loved ones with a gift from our store.